Ph.D. from National University of Singapore - 2013. M.Tech. in Materials Science and Engineering from IIT Kharagpur – 2008. M.Sc. in Physics in from Banaras Hindu University, Varanasi - 2004. B.Sc. (Physics, Chemistry, Maths) from Udai Pratap College, Varanasi-2001. 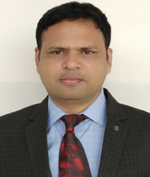 OP Jindal University, Raigarh (C.G), Working as a Assistant Professor (Sr. Grade) from August 2018 to till date. Worked as a post-doctoral fellow in Tata Steel Advanced Materials Research Centre at Centre for Nano and Soft Matter Sciences, Bangalore from August 2017 to August 2018. Worked as an Assistant Professor at NIT Kurukshetra from December 2013 to July 2016. Worked as a post-doctoral research fellow at Nanyang Technological University, Singapore from July 2013 to December 2013. Worked as a post-doctoral research fellow at National University of Singapore from September 2012 to July 2013. Nanomaterials for energy storage devices, sensors, electrocatalysts, corrosion protection, bipolar plates in fuel cells and biomedical applications. Silver Nanoparticles and Antibacterial Activity, Ram Sevak Singh, Himanshu Sharma, LAP LAMBERT Academic Publishing, Germany, ISBN: 978-3-659-80241-6, (2015). Nitrogen-Doped Graphene Oxide-Silver Nanoparticles Nanocomposite, Ram Sevak Singh, Aseem Rasheed, LAP LAMBERT Academic Publishing, Germany, ISBN: 978-3-659-90360-1, (2016). Computational study of SiC nanotubes for hydrogen storage, Ram Sevak Singh, LAP LAMBERT Academic Publishing, Germany, ISBN: 978-620-2-05987-9, (2017). Ji Wei, Wee ATS, Chen Wei, Venkatram Nalla, Ram Sevak Singh, Laser Patterning of Graphene/ Graphene-oxide Schottky Junction for Photoconductive and Photovoltaic Applications, US, 61/515,380, Sep 2011. Funding Agency: SERB, Govt. of India. Ram Sevak Singh, Dehui Li, Qihua Xiong, ImanSantoso, Wei Chen, Andrivo Rusydi, Andrew Thye Shen Wee, “Anomalous photoresponse in the deep-ultraviolet due to resonant excitonic effects in oxygen plasma treated few-layer graphene”, Carbon, 106, 330 (2016). Impact Factor=6.1. Ram Sevak Singh,Venkatram Nalla, Wei Chen, Andrew Thye Shen Wee, Wee Ji,“Laser Patterning of Epitaxial Graphene for Schottky Junction Photodetectors”, ACS Nano, 5, 5969 (2011). Impact Factor= 13.33. Ram Sevak Singh, VenkatramNalla, Wei Chen, Wei Ji, Andrew T. S. Wee,“Photoresponse inepitaxialgraphene with asymmetric metal contacts”, Applied Physics Letters, 100, 093116 (2012). Selected for the March 19, 2012 issue of Virtual Journal of Nanoscale Science and Technology.Impact Factor = 3.8. Iman Santoso, Ram Sevak Singh, Pranjal Kumar Gogoi, Teguh Citra Asmara, Dacheng Wei, Wei Chen, Andrew T. S. Wee, Vitor M. Pereira, and AndrivoRusydi, “Tunable optical absorption and interactions in graphene via oxygen plasma”,Physical Review B, 89, 075134 (2014).Impact Factor = 3.76. Iman Santoso, Ram Sevak Singh, Pranjal Kumar Gogoi, Teguh Citra Asmara, Dacheng Wei, Chen Wei, Andrew T. S. Wee, Vitor M. Pereira, Andrivo Rusydi, “Effect of oxygen plasma on the optical properties of monolayer graphene”, Advanced Materials Research, 896, 510(2014). Ram Sevak Singh, Xiao Wang, Ariando,Wei Chen,Andrew. T. S. Wee,“ Large room-temperature quantum linear magnetoresistance in multilayered epitaxial graphene: Evidence for two-dimensional magnetotransport.” Applied Physics Letters 101, 183105 (2012).Impact Factor = 3.8. Roland Yingjie Tay, Mark H. Griep, GovindMallick, Siu Hon Tsang, Ram Sevak Singh TravisTumlin, Edwin Hang Tong Teo, and Shashi P. Karna, “Growth of Large Single-Crystalline Two-Dimensional Boron Nitride Hexagons on Electropolished Copper”, Nano Letters, 14, 839 (2014). Impact Factor= 13.779. Roland Yingjie Tay, Xingli Wang, Siu Hon Tsang,Guan Chee Loh, Ram Sevak Singh, Hong Li, Govind Mallickand Edwin Hang Tong Teo, “A systematic study of the atmospheric pressure growth of large-area hexagonal crystalline boron nitride film”, Journal of Materials Chemistry C, 2, 1650 (2014). Impact Factor= 5.0. Ram Sevak Singh, “Influence of oxygen impurity on electronic properties of carbon and boron nitridenanotubes: A comparative study”, AIP Advances, 5, 117150 (2015). Impact Factor = 1.5. Ram Sevak Singh, Ankit Solanki, “Modulation of electronic properties of silicon carbide nanotubes via sulphur-doping: An ab initio study”, Physics Letters A. 380, 1201 (2016).Impact Factor = 1.67. Ram Sevak Singh, “Hydrogen adsorption on sulphur-doped SiC nanotubes”, Materials Research Express 3, 075014 (2016).Impact Factor= 0.968. Ram Sevak Singh, Ankit Solanki, Hydrogen adsorption in metal decorated SiC nanotubes, Chemical Physics Letters 660, 155 (2016). Impact Factor = 1.86. Gaurav Shankar, Ram Sevak Singh, A Review of Solar Energy Tracker and Models, Journal of Basic and Applied Engineering Research, Krishi Sanskriti Publications, 1, 2014, 110-114. (ISSN: 2350-0255). Surface energy controlled growth of single crystalline two-dimensional hexagonal (h)-boron nitride. Griep, M.H. ; Tay, R.; Tumlin, T.; Mallick, G.; Siu Hon Tsang; Singh, R. S.; Teo, E.H.T. ; Karna, S.P.Nanotechnology (IEEE-NANO), 2014 IEEE 14th International Conference on 18-21 Aug. 2014. Ram Sevak Singh, Electronic properties evolution in Sc-doped TiO2: A computational study, XXVII IUPAP Conference on Computational Physics, CCP 2015, IIT Guwahati, India. Aseem R, Ram Sevak Singh, Synthesis and Characterization of Nitrogen-Doped Graphene Oxide-Silver Nanoparticles Nanocomposites, 4th Nantional Conference on Nanoscience and Instrumentation Technology, NIT Kurukshetra, 2016. Ankit Solanki, Ram Sevak Singh, First principle study of Pt and Ni-decorated SiC nanotubes, International Conference on Materials Science and Nanotechnlogy, Delhi University 2016. Aseem R, Ram Sevak Singh, Study of photoluminescence in graphene oxide-silver nanoparticles nanocomposite: Influence of defects, International Conference on Materials Science and Nanotechnlogy, Delhi University 2016. Ram Sevak Singh, Dehui LI, Wei Chen, Qihua Xiong, Andrew Thye Shen Wee. High-Gain Ultraviolet Photodetectors Based on Oxygen Plasma Treated Epitaxial Graphene. International Conference on Materials for Advanced Technogies, Singapore (2013). Gourav Shankar and Ram Sevak Singh, Designment of Solar Energy Tracking System. Published in 3rd National Conference on Nanoscience and Instrumentation Technology held at NIT Kurukshetra, 2015. Himanshu Sharma and Ram Sevak Singh(2015). Surfactant stabilized silver nanoparticles: A study of antibacterial activity. Published in 3rd National Conference on Nanoscience and Instrumentation Technology held at NIT Kurukshetra, 2015. Ram Sevak Singh. Synthesis of Hexagonal Boron Nitride Thin Film: A Systematic Study. National Conference on Mastering in Molecules and Materials. Venue: NIT-Kurukshetra, Haryana. (2014). Himanshu Sharma,Ram Sevak Singh.Synthesis and Characterization of Silver Nanoparticles: Stabilization of Nanoparticles Using Surfactant. National Conference on Mastering in Molecules and Materials. Venue: NIT-Kurukshetra, Haryana. (2014). Ram Sevak Singh, Roland Yingjie Tay, Siu Hon Tsang, Edwin Hang Tong Teo.Large Area Two Dimensional Hexagonal Boron Nitride Thin Films: Synthesis, Characterization, and Band Gap Narrowing. 4th Trilateral Conference on Advances in Nanoscience: Energy, Water, and Heathcare. Venue: Nanyang Executive Centre, Nanyang Technological University, Singapore-639673. (2013). Ram Sevak Singh, Venkatram Nalla, Wei Chen, Wei Ji, Andrew T. S. Wee. Photoresponse in epitaxial graphene with asymmetricmetal contacts. The 5th MRS-S Conference on Advanced Materials. Nanyang Executive Centre, NTU, Singapore. (2012). One-week short- term course on “Nanomaterials for Two Dimensional Devices and Energy Applications”, 2015. One-day workshop on “ Simulation Tools for Nanostructure and Device Modeling”, 2015. “ Synthesis and characterization of boron nitride thin films” at NIT Kurukshetra. “Development of graphene and devices” at IETE, India. NET(JRF) in PHYSICAL SCIENCES, 2006. GATE in Physics, 2006, All India Rank: 43. Call for SHYAMA PRASAD MUKHERJEE FELLOWSHIP (SPMF) award. The coveted IETE-CEOT(94) Award (Biennial)-2014. Young Scientist Award from Venus International Foundation (VIFRA-2015). Young Scientist project grant Award from SERB-DST, Govt. of India.